It’s that time of year again – when we start plotting and planning our most important meal of the year. 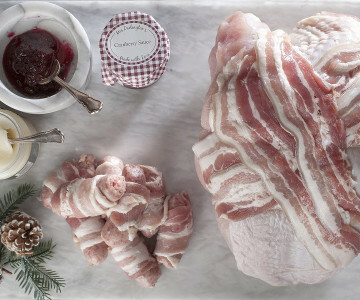 Luckily Creamline is on hand to help make your Christmas dinner as spectacular as can be this year, with some glorious produce from Little Pigs Didsbury. The team have handpicked some magnificent joints for this season, along with some mouth-watering extras to make these showstopping packages. The star of the show – a full turkey crown, hand prepared by the Little Pigs team. Complete with pigs in blankets, goose fat, and cranberry sauce. Ideal for smaller gatherings, this is a half turkey crown – but with all the trimmings! Not a turkey lover? Try this succulent Cheshire beef topside – with Mrs Darlington’s horseradish sauce of course. Lovingly prepared by Little Pigs, this premium pork loin is a crowd-pleaser. Complete with rich, sweet apple sauce. Perfect for Boxing Day, gammon roasts don’t come much better than this juicy, tender joint from Little Pigs. If you’re looking for something a little smaller than the Fir Package, the half gammon joint is for you. Complete with all the trimmings, including Mrs Darlington’s apple sauce. All of these exclusively sourced packages are available to order now, right up until the 22nd December - with free delivery to your doorstep. If you haven’t used the LoveLocal discount code yet, why not treat yourself to 50% off your Christmas Best of Local order? Creamline’s Christmas Deliveries: We’re Here to Help!